JERUSALEM (JTA) — Israeli Prime Minister Benjamin Netanyahu called on U.N. Secretary-General Ban Ki-moon to use his position to help pressure Hamas to repatriate two Israeli citizens and the bodies of two Israeli soldiers. Ban and Netanyahu also met with the families of presumed killed Israeli soldiers Oron Shaul and Hadar Goldin, whose bodies are being held by Hamas in Gaza. Two Israeli citizens are also being held by Hamas in Gaza — Avera Mengistu, a 28-year-old Ethiopian Israeli, and an unidentified Bedouin Israeli — who crossed into Gaza of their own volition. Netanyahu reminded Ban of his stated goal during a 2013 visit to Israel to work to halt anti-Israel bias in the international body. “Regrettably, the goal of treating Israel fairly remains unfulfilled across a wide spectrum of U.N. activities and U.N. forums,” Netanyahu said. 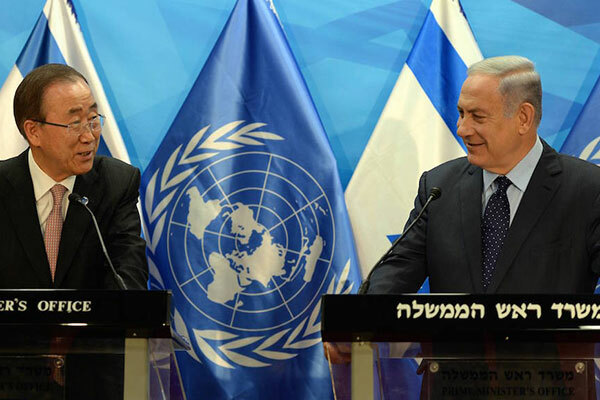 Ban called on Israel to work quickly toward a two-state solution. Earlier Tuesday, Ban visited the Gaza Strip, where he called on Israel to lift the “suffocating” blockade on the coastal strip, Reuters reported. “The closure of Gaza suffocates its people, stifles its economy and impedes reconstruction effort. It is a collective punishment for which there must be accountability,” Ban said. The call to lift the closure came a day after Israel and Turkey announced a reconciliation agreement that keeps the blockade in place.